In this episode the Joshes are joined by David Windestal to introduce you to the world of multi-rotor craft. These aircraft are quickly growing in popularity in part for their odd looks, ease of flying, and abilities as a camera/FPV platform. David shows us the basics of his tricopter, while touching briefly on the topic of quadcopters. Josh Scott experiences a little tricopter envy, until he breaks out "his" craft. The show concludes with an FPV ride on David's tricopter, and a crash assessment. Tune in to see what damage was caused. David is an amazing builder. I love the how his design is functional, durrable, and easily repaired. I am so happy he shares his knowlege so freely. So josh, wooden arms are the way to go?? I think building one of these is gonna be my winter project this year. Those plans and that shopping list really makes it doable. Well IMHO.....I would say that you really cant go wrong with either one. I own and have flown a couple different Tri-copters based on the design provided by David at rcexplorer.se and they fly amazing! I own the Miniature Aircraft Rotor X 404 quad-copter and it flies really well also. I then took the motors/esc's/kk board from my MA Rotor X, and put them on my own quad frame design that I am extremely happy with. In my experience, I have found that Tri's and quads have some slight differences as far as flight characteristics....but nothing to terribly drastic. Tri's because of their thrust vectoring tail, have a very positive YAW response as compared to the quad. Tri's need to be flown with rudder/aileron coordination, because they tend have a little bit of tail sag when goin into turns.....however some nose-in yaw input (much the same as a traditional heli or a J-3 Cub) will keep the tail "flying high" through your turn and remedy any "tail low" turns. The quads I have flown seem to be exactly opposite....when heading into a turn (at least at slower speeds) they "seem" to prefer to skid or crab through turns. This requires cross-controlling of rudder & aileron to keep it "flying right". At higher speed you can bank quads more aggressively but they just respond slightly different than the tri. As far as orientation in the air.....both are equally tricky to see. Each platform has certain angles that are hard to orientate when flying. LED lights, and some sort of "icon" on the forward facing side of a multi-rotor is VERY helpful ....especially when flying at first. (I have a Snoopy and a Woodstock that I sometimes stick on the front, that I can visually orientate the copter because of the direction that they are looking) Even after flying heli's off and on for more than a decade, the first time I flew a multi-rotor it took ALOT of concentration to keep things straight. In summary, I have both, I fly both, & most importantly, I really honestly LOVE both. They are both solid platforms......and although I am no expert by any stretch of the imagination.....I am learning alot, and having a blast doing it. I havent flown my 450 traditional heli one time since getting into multi-rotors this summer.....thats truly how much FUN they are. Multi-rotors FTW! Get one.....fly one..... LIFE = GREAT. I have a question. What does a KK board actually do? What is its purpose. 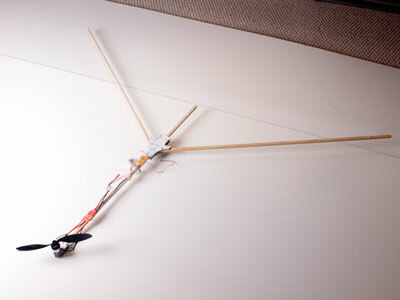 Can a scratch built tricopter be built without one (and fly)? A KK board is just one version of a multicopter controller board. There are a handful of different types of control boards out there. KK boards from my experiences are pretty solid and are seemingly very reliable. (so far at least, I have a few hundred flites on the boards that I have without one problem) I have not owned anything other than KK boards so I cannot comment from experience about any other boards. KK boards as most things, are continually getting better. The first KK red boards, and the second KK blue boards flew with piezo gyros. The newest KK black boards, have MEMS gyros which are supposedly WAY more stable.....with much less in flite drifting. Both my quad and my tri-copter have the new style KK black boards in them.....I have flown Josh B's tricopter a few times, which if I remember correctly has the red board (dont quote me) and the only thing I noticed about his was that you have to "lean" on the rudder a tad to track straight in forward flite. However I believe that is because all 3 of his motors turn the same direction where as my tricopters 2 front motors turn opposite of each other which cancels the torque. the advantage that Josh has, is that he can use conventional props on all of his motors, where I have to use one conventional and one pusher. The advantage mine has is that I dont have to worry about the torque causing my machine to yaw. The prop thing in my situation isnt a big deal, cause I also fly a quad which requires conventional and pusher props to fly....so I always have some spares of each. In summary KK boards are great.....I bought the controller card with mine so I can "flash" the programming back and forth from tri to quad, to hexa or even octo copter. which is pretty cool. Hope this helps ya. David from Sweden is the true expert, we have all learned a lot from him and from his website. he is a wealth of multi-rotor knowledge. Wow. That is really a comprehensive response and much appreciated. Since the build willl take a little time in acquiring the parts perhaps I will attempt the tri without the KK and then get one of those at a later date. I'm a bit stubborn and cheap which can make for a frustrating but enlightening combination depending on the situation. Thanks a bunch for getting me up to speed on that. It may not be the best KK board out there but its a start and that's what I used on my tricopter, I'm no expert but it flys good enough for me and I'm happy with it. So with neither a kk board nor any gyros this would be un-flyable?